Several national publications have featured the Florida Open Debate platform, including USA Today, Engadget, and The Atlantic. Caktus helped develop the Django-based platform on behalf of the Open Debate Coalition (ODC) in advance of the nation’s first-ever open Senate debate held in Florida on April 25th. The site enabled citizens to submit debate questions as well as vote on which questions mattered most to them. 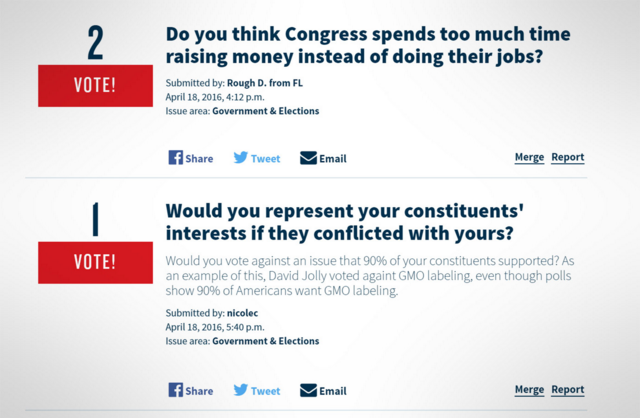 Moderators then used the thirty most popular questions from the site to structure the debate between Florida Senate candidates David Jolly (R) and Alan Grayson (D). According to The Atlantic, more than 400,000 votes were submitted by users on the site, including more than 84,000 from Florida voters. The Florida debate was streamed live on Monday to more than 80,000 viewers. The Open Debate platform is receiving attention and interest from various potential debate sponsors as well as the Commission on Presidential Debates for possible use in the in this fall’s presidential elections.